Shooting games are always fun to play. Kazap.io is one hell of a shooting game I have ever seen. I can say it is the best ever online web browser game. The players count is increasing day by day. People install heavy shooting games on their computers and phones but this is the game that provides everything which is being provided by some other well-established company. 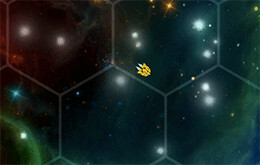 Kazap io does not contain large maps and has spaceships in it which is very entertaining for the players. There are many shooting games there in io games but this one is a little different from them. You need to move your spaceship around the given space. There are boarders shown on the map. You need to stay away from them while moving and shooting other enemies. There is a mini-map available from where you can find your enemies and shoot them. You don't need to be so aggressive at the start of the game as there will be many opponents at that time. Take some time and wait for your turn and do not let anyone kill you. The last man standing will be the winner in the game. Do not forget to grab the amazing boosts in the game. Once you kill someone you'll see some cloud-like particles there on the map. The strategy of winning the game is simple. Be safe and attack only when there are not enough spaceships on the map. You need arrow keys to fly your spaceship on the map. X key is used to shoot the enemy. Spacebar or shift key is used for boost option. That's all I can share with you. Now it is your turn to take on the game and prove yourself that you have the best defending and attacking skill than any other player playing the game.